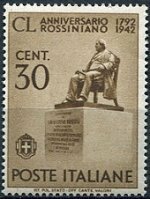 "Zwei Volker und Ein Kampf" = "Two Peoples and One Struggle"
The commemorative stamps of Italy, for the period from 1941 to 1942, encompass the wartime relationship between Italy and Germany, an ancient Roman historian, an astronomer, a composer, and wartime patriotic propaganda. The six stamps of Italy shown above (Sc. 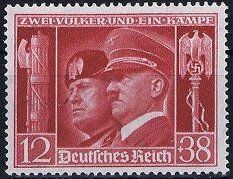 #413-18) were issued in 1941 to celebrate the Rome-Berlin Axis. The 10 C., 20 C., and 25 C. denominations feature civilian profiles of Adolph Hitler and Benito Mussolini. The 50 C., 75 C., and 1.25 L. denominations feature military profiles of Adolph Hitler and Benito Mussolini. The 10 C., 20 C., and 25 C. denominations with the military profiles of the higher denomination stamps, were prepared but never issued. They were sold for charitable purposes after the war, and they are not expensive. 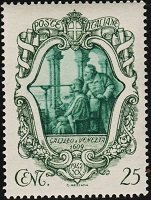 The four charity stamps of Italy shown above (Sc. #B43-46) were issued on December 13, 1941 to commemorate the 2,000th Anniversary of the Birth of Livy. The designs depict an ancient Roman battle scene and ancient Roman warriors. Titus Livius Patavinus (59 B.C. - A.D. 17), known as Livy, was a Roman historian. He wrote a monumental history of Rome and the Roman people, from 753 B.C. through A.D. 14. He was on familiar terms with the Julio-Claudian family, and he advised Caesar Augustus' grand nephew, the future emperor Claudius, to focus on historical writing. The four stamps shown above (Sc. 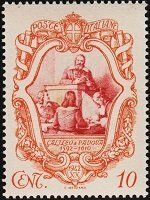 #419-22) were issued on September 28, 1942 to commemorate the 300th Anniversary of the Death of Galileo. 10 C. - Galileo teaching mathematics at Padua. 25 C. - Galileo presenting a telescope to the Doge of Venice. 50 C. - Portrait of Galileo. 25 C. - Galileo studying at Arcetri. Galileo Galilei (1564-1642) was an Italian physicist, mathematician, engineer, astronomer, and philosopher that played a major role in the development of modern science. Galileo has been cited as the father of observational astronomy, the father of modern physics, and the father of modern science. It was his championing of the theory of helocentrism, his theory that the earth and planets revolve around the sun, that got him into trouble with the Church of Rome. He was tried in 1633 and found guilty of Suspicion of Heresy. He was forced to recant his theory, and he spent the remainder of his life under house-arrest. The stamps shown above (Sc. 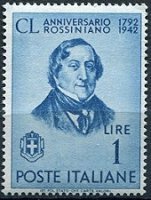 #423-26) were issued on November 23, 1942 to commemorate the 150th Anniversary of the Birth of Rossini. 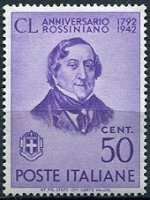 Gioachino Antonio Rossini (1792-1868) wrote 39 operas, as well as sacred music, chamber music, and some instrumental and piano works. His song-like melodies are evident throughout his scores, and for these, he has been nicknamed the "Italian Mozart". Until his retirement in 1829, he had been the most popular opera composer in history. The propaganda stamps of Italy shown above (Sc. #427-38) were issued in 1942 in Honor of the Italian Armed Forces. The contemporary 25 C., 30 C., and 50 C. definitive postage stamp denominations were re-issued, with each stamp having an adjourning patriotic propaganda label printed to its right. There were four patriotic propaganda labels, which were repeated for each of the denominations. Discipline is the Weapon of Victory. Everything and Everyone for Victory. Arms and Hearts Must Be Stretched Out Towards the Goal. Of course, victory never came. About a year later, Northern Italy was occupied by the Germans and Southern Italy was being invaded by the Allied Powers. King Victor Emmanuel III dismissed Benito Mussolini and his fascist government and negotiated an armistice with the Allied Powers. The war was "over" for the Kingdom of Italy. Mussolini was forced to flee to Northern Italy, where he managed a German-controlled Socialist Republic for the remainder of World War II.